Celebrating the sacraments is at the core of our parish life. There are many groups that give support as people prepare for the celebration of the sacraments. Here we provide the details of those groups in our parish. The Latin word 'sacramentum' means 'a sign of the sacred'. The seven sacraments of the Church are outward signs, instituted by Christ, that confer grace upon those who receive them. The material and spoken actions present in the different rituals point to what is sacred and significant for Christians. In this sense sacraments are analogous to doors which open up to us an experience of the sacred. With a validly celebrated sacrament God's grace is conferred ex opere operato ('by the work worked'). Through these sacraments the Church - empowered by the Holy Spirit - continues Christ's work of healing and salvation among its members. 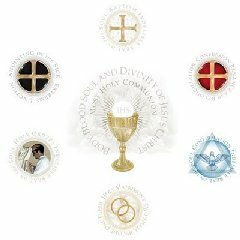 Select from the menu on the right to learn more about each of the seven sacraments. The parish of Donnycarney, constituted in 1952 from the parish of Marino, is situated about five kilometres (three miles) from the city centre and is near the junction of Malahide Road and Collins Avenue.